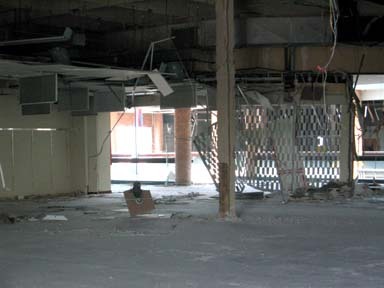 More than 8 years ago I walked through Chicago’s troubled Brickyard Mall with my first digital camera, taking tons of pictures in anticipation they’d someday be the only surviving documentation of the mall – and then I promptly lost them. Very recently, though, when consolidating some old photo CDs onto a larger hard drive, I rediscovered these great “vintage” shots of retail history that is now gone forever. I hope you enjoy seeing them and reading Brickyard’s story as much as I enjoyed finding the pictures and reliving the memories. 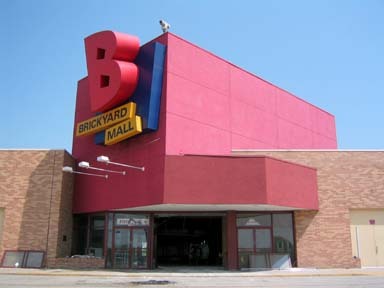 Brickyard Mall, which opened in March 1977 on Chicago’s northwest side, was one of two regional, suburban-style shopping malls constructed in the city – the other was Ford City Mall on Chicago’s south side, which opened in 1965. 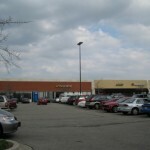 Three other regional malls are, however, literally within a stone’s throw of the city limits – Lincolnwood Town Center, Harlem-Irving Plaza, and Evergreen Plaza all are located either directly across the street from the city or just blocks from it. 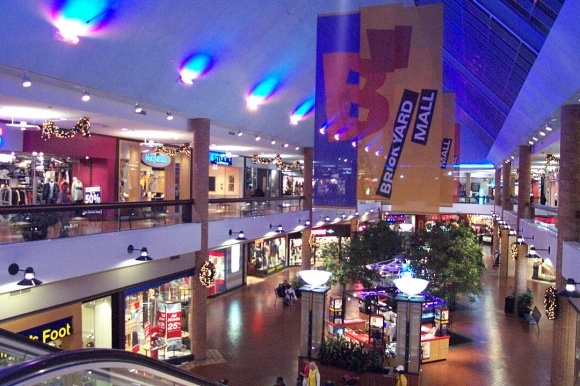 Brickyard Mall enjoyed a modicum of success through the 1980s, but in the 1990s its viability met opposition as neighborhood demographics changed and competition from other malls outmoded it. 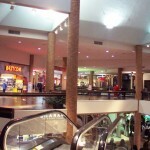 The late 1970s was the middle of a great enclosed mall building boom across the United States. The overbuilding of these hulking behemoths was often done without extensive foresight and with little abandon. 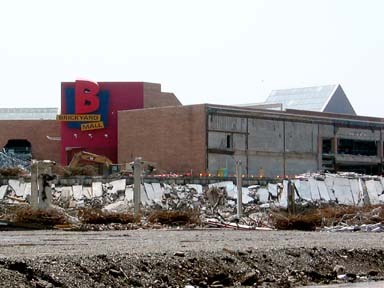 Brickyard Mall was built with two major goals in mind, neither of which would ultimately guarantee its permanency. 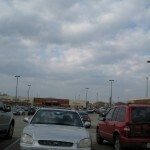 The first and main goal of Brickyard Mall was to give local residents a regional shopping center. Belmont-Cragin, the neighborhood which Brickyard Mall anchors, was mostly built out by World War II with a modest housing stock of bungalows, cape cods and two-flats, which were intended to house Polish immigrant factory workers. Over time, the factories which originally brought these immigrants to the far northwest side of Chicago closed, the original population left, and incomes have dropped. The Polish influence on the neighborhood is still visible today, but has declined significantly in recent decades, as an influx of Hispanic immigrants has come to the area. As of 2000, the neighborhood is 65% Hispanic, and this number is almost certainly higher today. 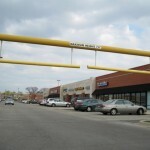 The second goal of Brickyard Mall was both political and fad-oriented. 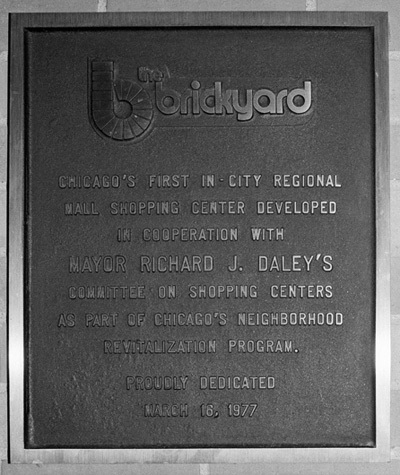 A plaque used to hang on the wall in Brickyard Mall, indicating that Brickyard was “Chicago’s first in-city regional mall.” It was signed by then-mayor Richard J. Daley, who put his name on practically every civic project the city invested in. 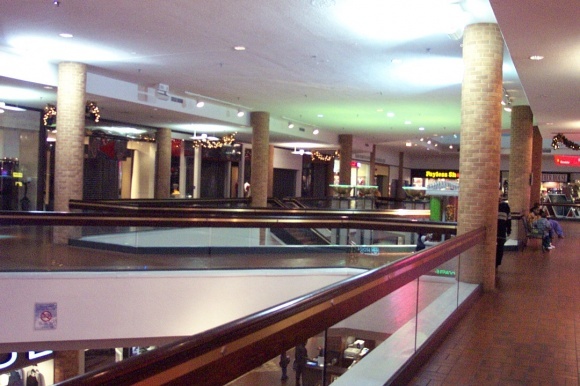 Malls were popular in the 1970s, so putting one in the city certainly helped promote him politically. 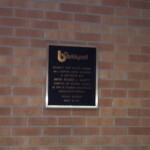 This plaque confuses me a little though, because Ford City Mall is also in the city of Chicago and opened in 1965 – 12 years before Brickyard. Wouldn’t Ford City have been first? Either way, Chicago wanted to get on the mall-building bandwagon, and selected a former brickyard at the corner of Diversey and Narragansett for this infill development. The brickyard was also, for a short time in the early 1970s, the city of Chicago’s first ski hill – anyone who has been to Chicago and seen how flat it is knows how much of a mistake that was. 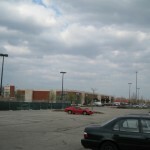 The site is located in a less-dense suburban area of Chicago, about 10 miles northwest of downtown, and was intended to supplant north and northwest side Chicago residents’ trips to suburban malls such as Woodfield, Randhurst, Golf Mill, and the nearest competitor, Harlem-Irving Plaza. 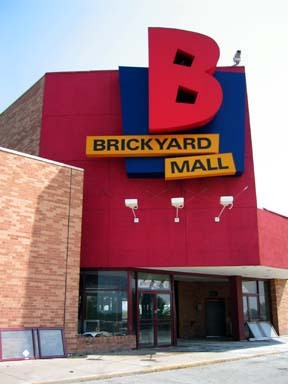 Brickyard Mall opened in two phases, starting in 1977. 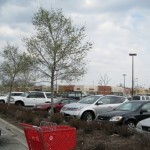 The first phase was anchored by Kmart and Chicago-based grocer Jewel-Osco, and was connected by an enclosed plaza with stores on one side and a wall of windows facing the parking lot on the other. 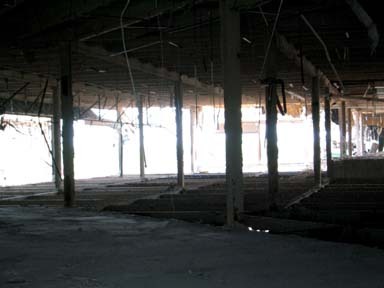 A two-level Montgomery Ward was also placed behind the enclosed section of the mall, to the south of it, a full level above the rest of the structure. 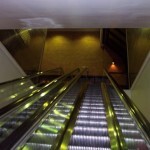 As such, an escalator ran from the middle of the enclosed portion of the plaza-mall up to Wards’ first level entrance. The grade separation at the site was a necessity because the site was formerly an artificial ski hill, so it was easy to just build the mall into the hill rather than to dismantle the hill and start over from a flat surface – plus, it gave the mall a very unique design. Due to the confusing floorplan, I threw together a sketch of the mall by labelling satellite imagery. 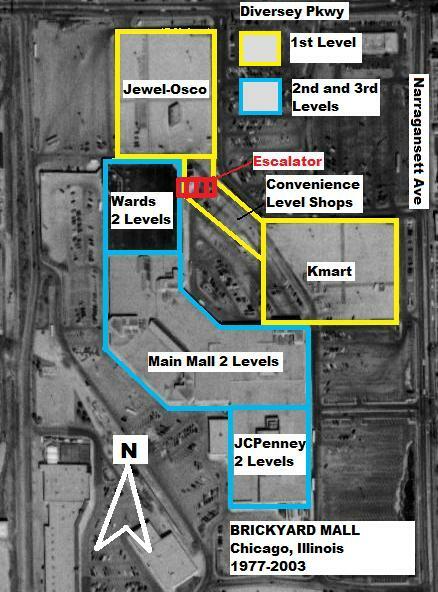 You can see in red where the escalator was, connecting the lower Convenience Level of the mall with second and third levels of the main mall through Wards. The sections labeled in yellow are a full level beneath the sections in blue. Essentially think of this layout as a bigger mall with two anchors spooning a little plaza mall, also with two anchors and located under it. 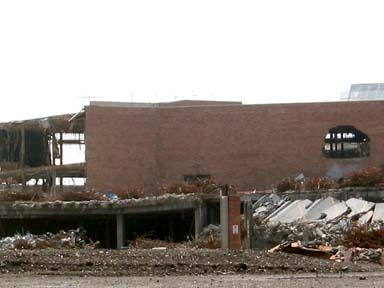 A major expansion at Brickyard took place over the next two years, as a huge two-level mall structure was added from Wards southward, ending at a 209,000 square-foot two-level JCPenney, which opened July 1979. The result was a weirdly-sewn-together frankenmall with a very interesting floorplan. 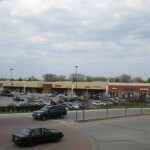 The original phase of the mall, featuring Kmart and Jewel-Osco and facing Diversey Parkway, was rebranded the Convenience Level, and was connected to the rest of the mall by Wards. 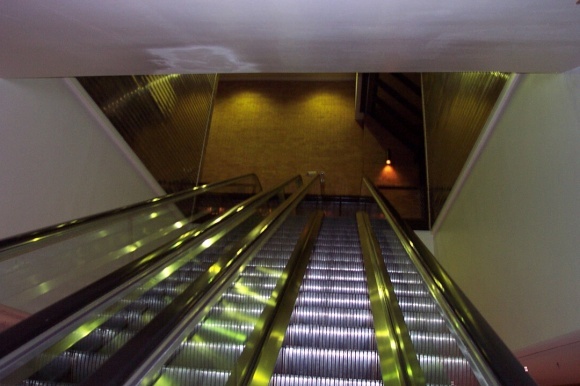 Shoppers using the Convenience Level could access Wards by ascending an escalator, located in the middle of the Convenience Level, which went up to a first level entrance of Wards. 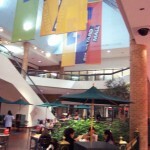 By going through Wards, they could then access the rest of the mall. This was a rather interesting and fun layout, giving Brickyard three separate levels, one (the Convenience Level) being completely disparate to the other two. 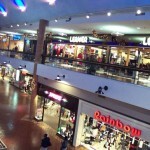 Also, while many malls are split by an anchor, Brickyard was split by both an anchor and an entire level. 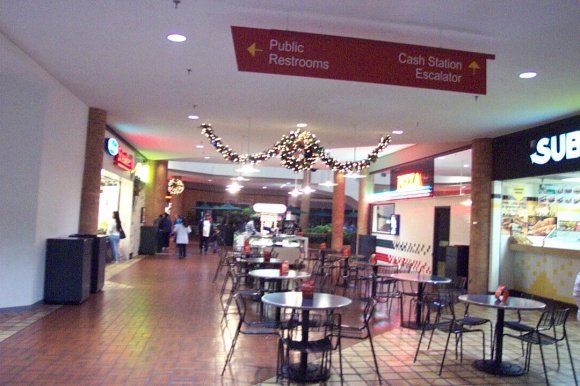 Due to the confusing nature of this setup, there was ample signage throughout all parts of the mall advertising how to get between the main mall and the Convenience Level stores. 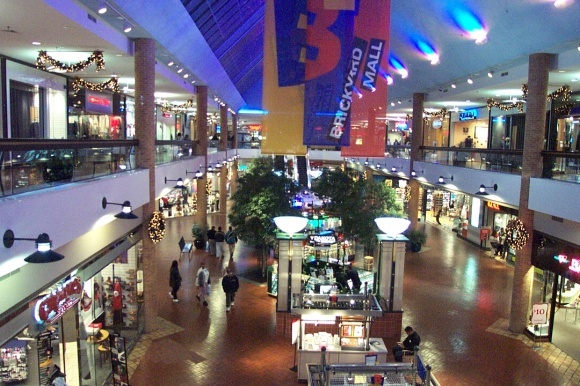 The brand-new Brickyard roared into the 1980s with success, as shoppers came from not only the surrounding neighborhoods, but from as far away as Edgewater and Lincoln Park via bus. 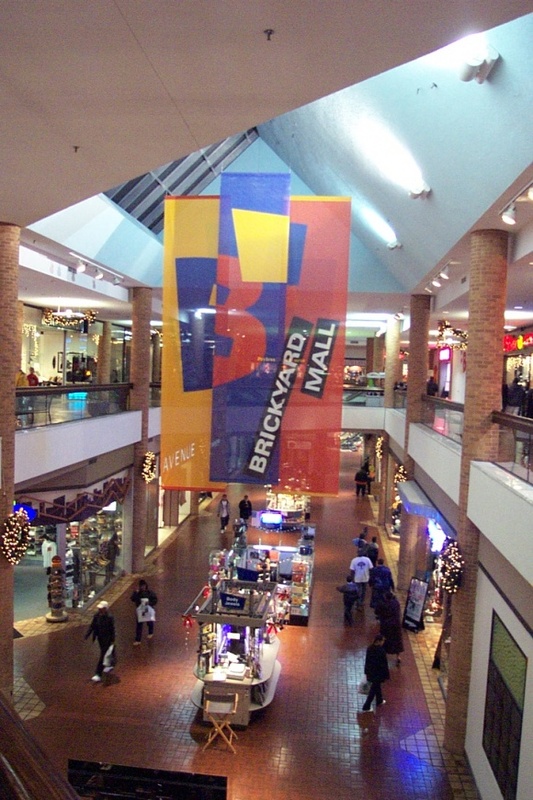 Brickyard was the closest mall to much of the north half of the city, and also to wealthier suburbs such as Oak Park, River Forest, and Elmwood Park. 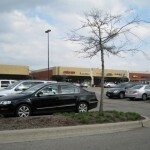 However, this influence wasn’t maintained due to changing demographics in Brickyard’s immediate area during the 1990s. In the 1990s, the Belmont-Cragin neighborhood, a pre-war area of modest, mostly single-family dwellings, lost its economic foothold as the manufacturing jobs that established the neighborhood floated away. The workers, mostly Poles who helped establish the neighborhood in the beginning, moved with the jobs, to other parts of the city or the suburbs. The immigrant group replacing these original settlers were predominantly Hispanics of lower income. 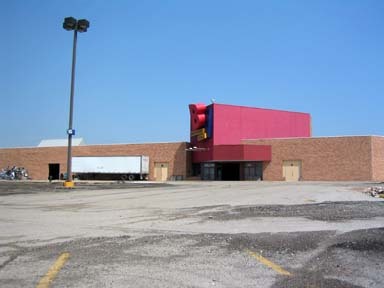 As these demographic changes took place, store turnover at Brickyard replaced national, mid-level stores with discounters and urban-wear stores. And, with the demographic shift also came a perception of crime. 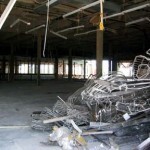 Whether real or not, as evidenced by these reviews on Deadmalls.com, patrons no longer felt safe here and began driving out to the suburban malls and skipping Brickyard. 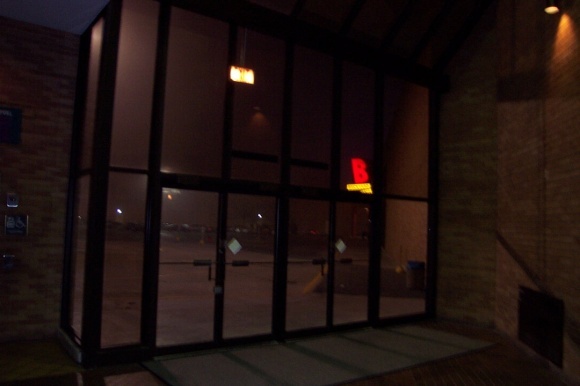 Also, at the end of the decade, JCPenney also downgraded their store to an outlet, an ominous predictor of what was to come in the 2000s. 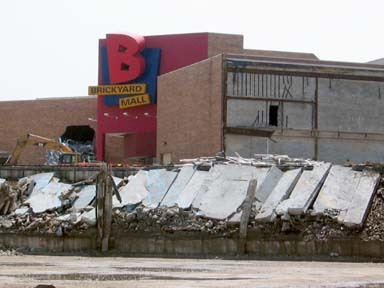 As the 2000s reared, Brickyard was no longer a viable regional mall. 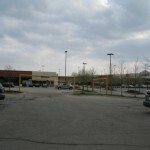 With a reduced selection of stores, a perception of crime, and changed demographics, Brickyard was demoted to a neighborhood center living in the husk of a regional mall. 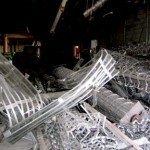 Bus trips were no longer bringing in throngs of city residents from across town, and Brickyard began bleeding stores. 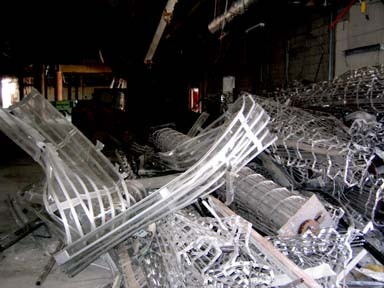 Over the course of a year, Brickyard lost all of its anchors except for Jewel-Osco. 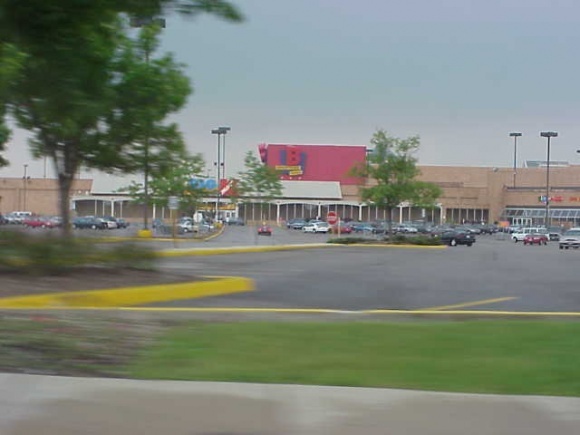 Kmart was the first to close in Summer 2000, followed by Wards in March 2001, and JCPenney Outlet was the last to leave in mid-2001. 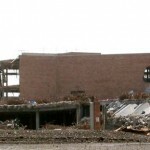 Wards’ closure wasn’t actually Brickyard’s fault, but a case of bad luck, as that entire chain folded; nonetheless, their departure was critical to accelerated demise at Brickyard, because their store bisected the two parts of the mall and connected them. 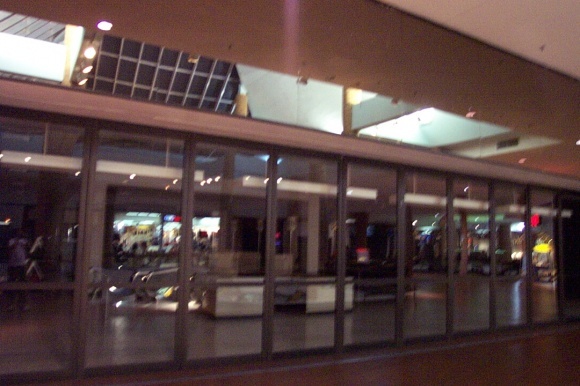 After Wards closed, it became necessary to walk outside and along the side of the store in order to access the rest of the mall from the Convenience Level. 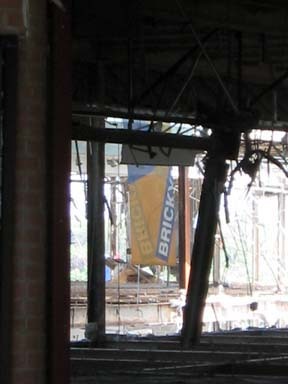 Like a ship without sails, Brickyard didn’t go very far for very long without anchors – a year and a half passed between the last of the anchors closing at Brickyard in 2001 and the announcement of redevelopment in late 2002. 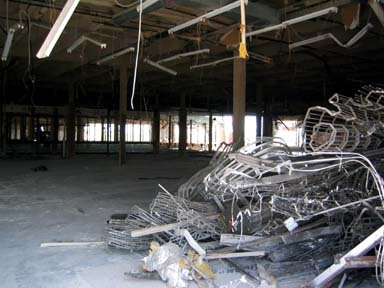 Not surprisingly, nothing was saved in the redevelopment, which commenced in May 2003 with the mall’s closing and immediate demolition. Jewel-Osco hung on for a few more months, operating out of its original building, while a new store was constructed a block south, opening in 2004. Securing fast and easy credit for the redevelopment, including a nice chunk of change from the city of Chicago, owner Goldman Sachs worked quickly to transform the Brickyard site. 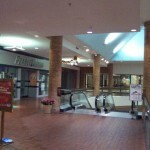 Although the mall was a failure as a regional enclosed mall, it was seen as a potential gold mine as a neighborhood power center. 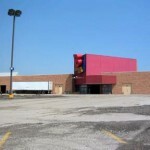 Because the city of Chicago and its near-suburbs are almost completely built out, space for big box power centers and new strip malls is at a scarce premium, and usually results from the redevelopment of former uses like industrial sites. Knowing they had a captive audience, Goldman Sachs jumped on this opportunity to be able to develop a brand new, large-scale suburban-style power center right in the city. 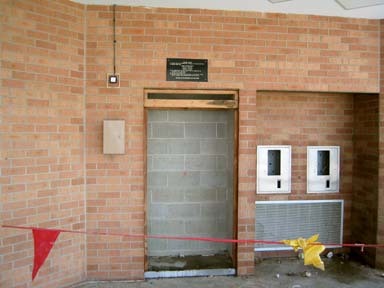 In late 2004, most of the power center opened. Anchored by big box stores Target, Marshalls and Lowe’s, The Brickyard, as it has been rebranded, is home to over 40 small stores as well. 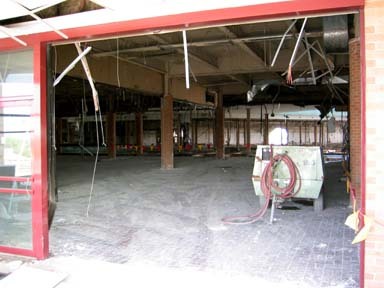 In fact, many of the stores that were in the Brickyard Mall at the end have reopened here, including multiple shoe stores, the Super China Buffet, Radio Shack, and Jewel-Osco. In addition, The Brickyard was home to the first midwestern location of Pollo Campero, a cult-popular Guatemalan chicken chain. 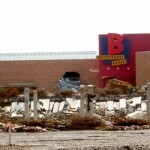 I visited Brickyard Mall several times between 1999 and 2001, and have only been back once since renovation, when I visited Pollo Campero a couple years ago. Other than that, there’s not much reason to go here unless you live in the area. Overall, though, I think this repositioning was successful. Sure, Brickyard is no longer that interesting to me, or anyone, and that’s a little sad; but I think if you look at the bigger picture, Brickyard is fulfilling its role as a neighborhood center. 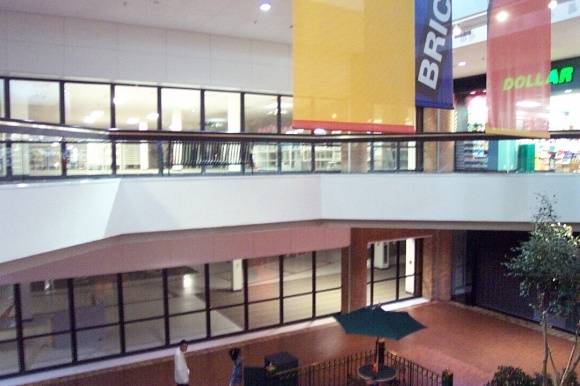 If I renovated the mall, I wouldn’t have totally removed the two-level enclosed mall; instead, I would have renovated it with modern, bright flooring to replace the dark brick, adding comfy seating and bright colors on the walls. 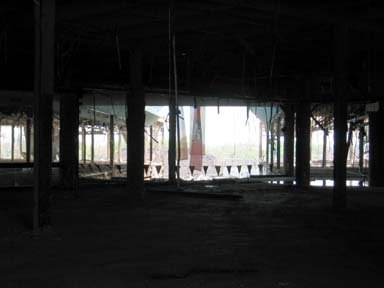 The natural light from the skylights would flood the center, and it would feel vervey again. I think people would come to the renovated mall, especially considering the density of the city, and although it would be a neighborhood center rather than a regional mall, it would still thrive. I would have used Target and Lowe’s to replace JCPenney and Wards, and put Marshalls and other big box stores along the main mallway somewhere. I probably would have removed the Convenience Center portion of the mall, though, since that portion of the mall was the most outdated of all. 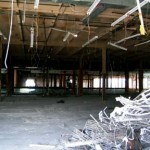 What would you have done with Brickyard Mall? How do you feel about the renovation? Leave your own memories and thoughts on our comment page. UPDATE 4/7/10: I went down to Chicago the other day and swung by the “new” Brickyard development, and here it is! Is that a vintage Lerner New York? Wow! If the Wards were a different anchor, or if it and JCPenney had been in the opposite positions, this probably could’ve survived a little longer. 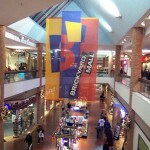 I really liked the color scheme used for the mall’s logo and banners. I also would have really gotten a kick out of its unusual layout. 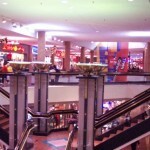 As to lifestyle centers, I think they are a big mistake. All they are to me is just mega strip malls turned to face each other with maybe a department store or two in them with some neo-traditional decor to make it look less like a strip mall. They have little charm at all. 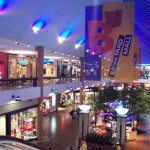 I wish they’d just go back to the classic open-air malls personally. When I visited a lifestyle center recently, I found it uninviting and like a game of musical chairs trying to find a parking place…constant motion for cars to crank up then re-park in front of their store of choice jockeying for that elusive parking space. It’s not good for the obesity epidemic and even less healthy for the environment. I think mall owners need to seriously consider just turning malls inside out (removing the roof entirely) or simply covering the corridors in front of the shops then removing the roof in between to create a lush courtyard. The issue I understand of why they’re knocking down the malls has less to do with competition or the economy and more to do with the cost of operation, period. I went to brickyard twice after it was torn town and rebulit, once on the bus for a quick errand to Target (don’t do this on a cold windy day… getting from the bus stop to Target is hard if there’s any sort of weather) and once to Jewel for a gallon of milk driving home from the dancewear outlet. At least the parking lots are super busy. They’re also difficult to navigate now. They could’ve easily kept this an indoor shopping center by just keeping Jewel in its old space, putting Target, Marshalls (or maybe a TJMaxx/Homegoods store… they’re the same company anyway) in an anchor space, and another anchor. Maybe not a Lowe’s (there’s a Home Depot or something just down the road anyway), and maybe Jewel and Target need bigger spaces than the old Kmart and Jewel spaces, but it could’ve been done. I think the city just wants people to drive more honestly. 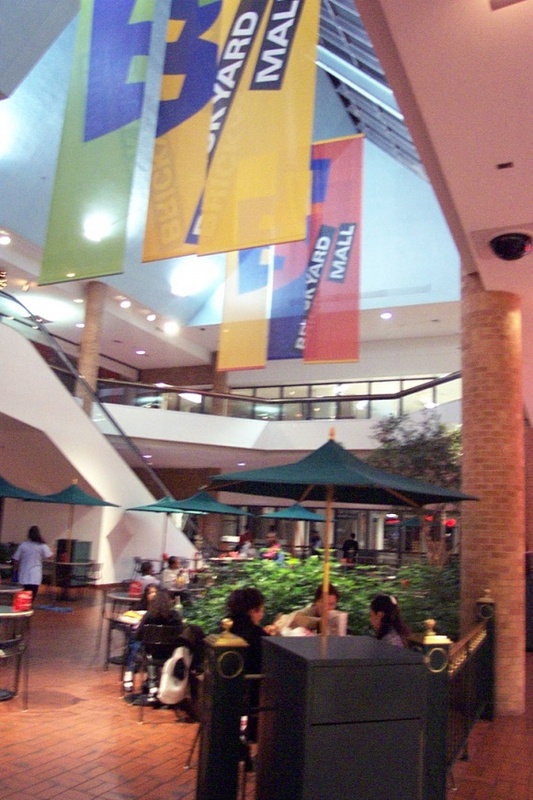 I think they went a little overboard with the Brickyard Mall banners hanging over the mall area, the mall branding over the entrances are good enough. The convenience level reminds me of Northway Mall near Pittsburgh. 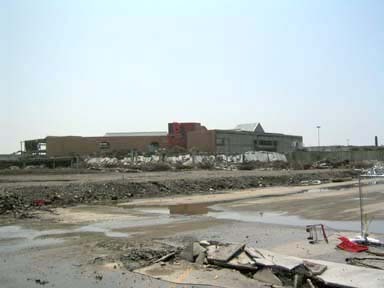 It is similarly set up with a row of stores facing a glass wall downstairs and a traditional mall right above it, although half of the upper mall was demolished a few years ago and currently faces the parking lot. I do like the interior though with the warm tones, but admittedly it is kind of dated… if it was located in a more affluent area, this mall would likely be very successful. 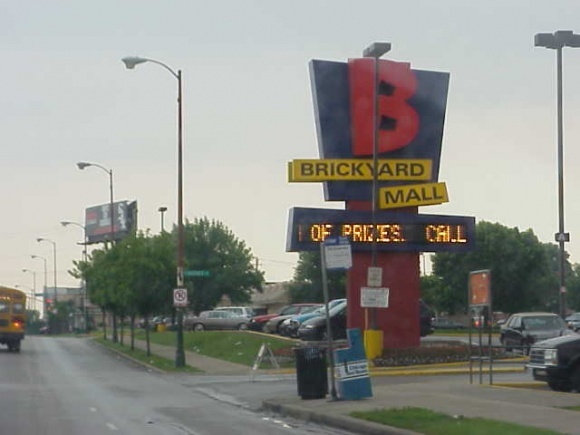 Brickyard was technically further out than Belmont-Cragin, which had its own, smaller shopping district anchored by Goldblatt’s (it’s one of the few Goldblatt’s to stillexist after all of the repeated bankruptcies). I remember Brickyard from its heyday. It and Harlem-Irving drew from all over the North Side. 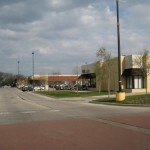 The development of Clybourn Avenue as a intown big box strip probably contributed to Brickyard’s decline as much or more than demographic shifts nearby—that area became a huge draw for the near lakefront neighborhoods from the late 80s onward and had a much wider variety of stores at different price points. 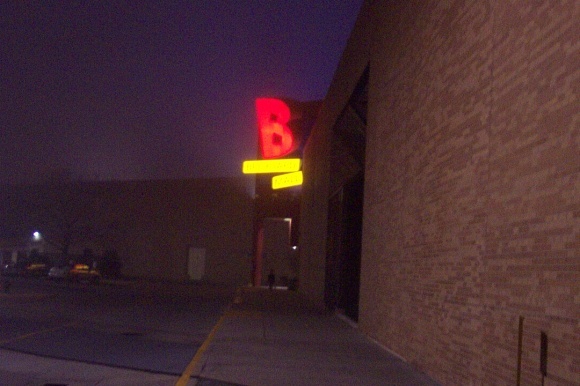 Brickyard Mall made a recent “reappearance” from beyond the grave when the local ABC station used a clip of it to illustrate a news story about business and retail, or some such news item. Just like when they show years-old footage of brand-new cars to illustrate a story about GM, Ford or Chrysler, the Brickyard clip brought a laugh from this viewer. I can’t seem to stop looking at that logo…lol. It is delightfully tacky and I love the mall’s name. It kind of sounds like Dogfight Mall, Dragstrip Mall, Roughneck Mall or Trailerpark Mall which makes that logo all the more amusing. Words fail me in the description of it. @JT, what if they called it the Graveyard Mall? 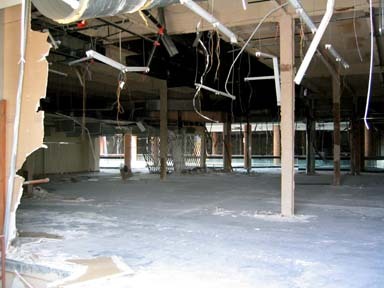 It would technically have to be a “dead” mall, lol. 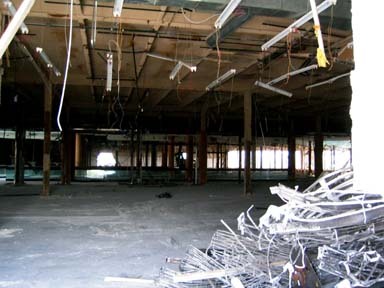 Lets not forget about Peebody Place, another dead retail project downtown. It’s noted features are a hotel of the same name & a 22-screen Muvico theatre. 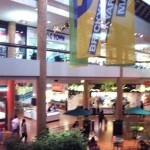 Stacy: We actually do already have a post on the Warwick Mall. 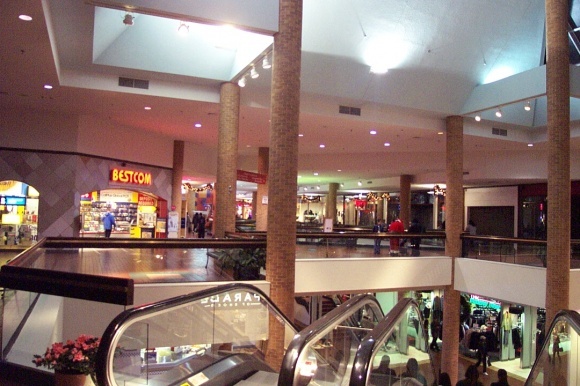 As a native Rhode Islander who grew up shopping at this mall, I’ve been following very closely. 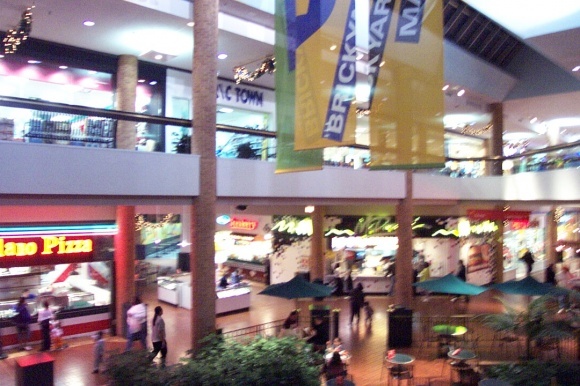 I used to live in the Chicago area and though never visited this mall, I remember they used to advertise for it on the radio a lot in the 90’s, tried to bring in people from other areas, they had sort of a catchy jingle i remember today. 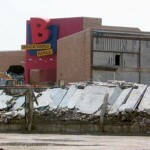 I don’t think you could have saved this mall though. 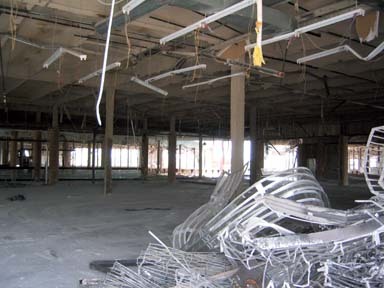 If you replaced the JC Penney and Wards with Target and Lowe’s, it still would be tough to fill the interior shops. You would have had a lot of independent hip hop and discount stores. 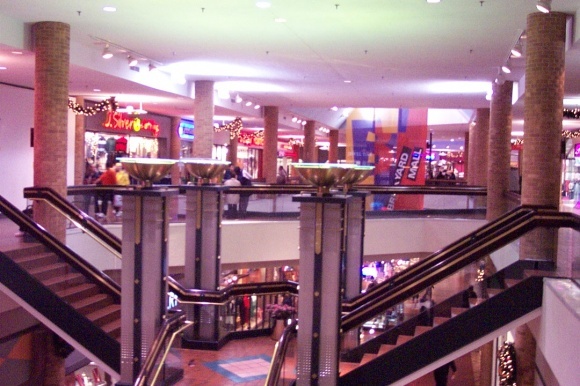 it seems that today retailers that go in malls are either upscale or you have the discount stores that prefer power centers with Walmart and Target. 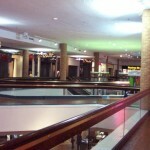 There just are so few successful lower to middle range chains that exist today to fill a mall. You could maybe do a mills-type mall here though, but the site is probably too small. 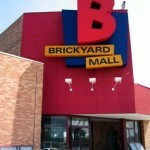 “Brickyard Mall” The name quite says it all. Doomed right from the very start. Talk about self-fulfilling prophecies. reminds me of “i party”, oh well. A River Runs Through It……………. 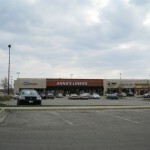 I used to manage a store in 1991 in a strip mall to the south of the former Brickyard Mall. It was called Bricktown Center, and it was flanked by a free standing Silo (later Circuit City) and a large Odeon Theatre. On the north corner of Naragansett and Diversey, there was a Mc Donalds. On the opposite south corner, there was a Burger King. There was a second really weird Burger King tucked on the lower “covenience” level of the mall behind the escalator. 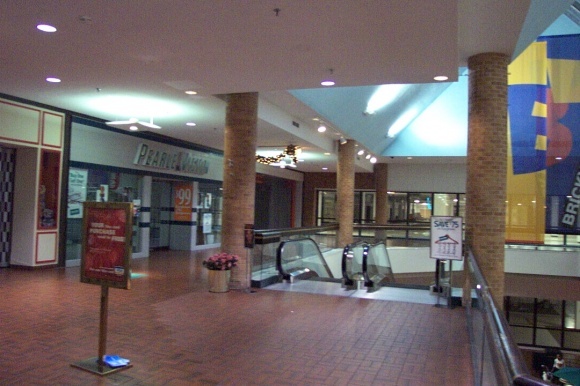 The year and a half that I visited the mall during my stint as a manager in one of the Bricktown Center Stores (Petland), I never considered anything “convenient” about that mall, which is why I think it failed. 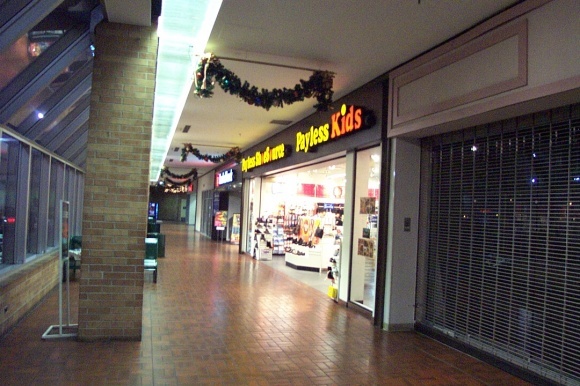 If the mall closed and you didn’t make it to “the gate” in time, you had to walk all the way around Kmart, outside the mall, to get back to the south entrance by Bricktown Center, the theatre, and Silo Electronics. 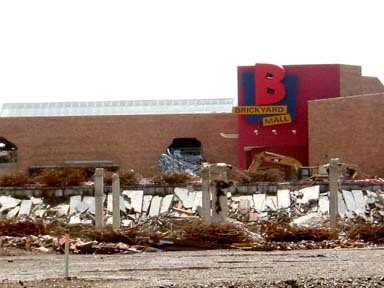 I have some vivid memories of Brickyard Mall. One of them is that on what I call “restaurant row” there was an A&W, and this was before these were really mall fixtures like they seem to be now. The A&W was right next to Subway, and you can’t see it in the photo. Also, in the convenience wing, there was a Bressler’s 33 Flavors Ice Cream, and a Whistle Stop Hot Dog place. 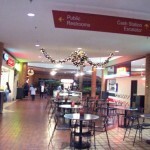 With the culmination of restaurant smells, especially from Subway at the time, the mall always smelled like “feet” to me. 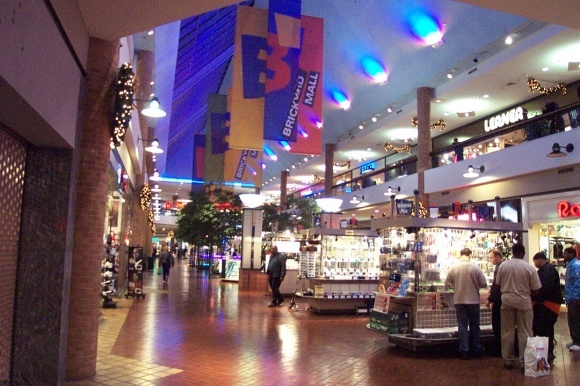 And I know this isn’t true, but because of the weird color scheme and the brick flooring, I always in my mind remember the mall to look like a giant Hot Sam’s Pretzel place turned inside out, for those true mall rats that might remember the bright yellow and orange formica-emblazened mall pitstop. 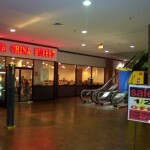 This mall also held a great childhood memory for me, as it housed one of the very few The Cookie Factory locations I’ve ever seen. 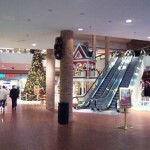 The other one was in Fox River Mall in Appleton, WI when I grew up in the mid-80’s. Damn, they had the best double decker chocolate chip cookie sandwich with this ultra-sugary vanilla or chocolate frosting piped in between. I shudder to think how many calories were in these cookie creations. I could never get by eating anything like that now, but when you’re a teenager, your metabolism will tackle anything and burn through it! The area seemed to have a large hispanic population even back in the 90’s. I don’t know why this was cited as a negative. The people that lived in the area really supported their neighborhood mall and the surrounding Bricktown Center, and I don’t remember experiencing any crime. Of course, i was gone by 1993 and perhaps things changed. But the hispanic people I worked with were very community oriented. 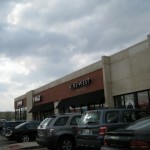 I was SHOCKED to return last year to see the entire mall had been leveled and replaced with this strip center! 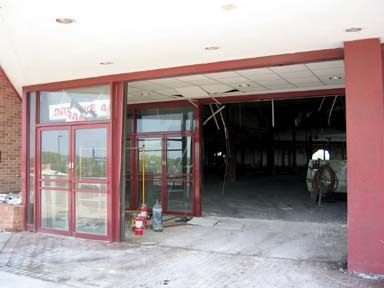 With the mall gone, it also made The Bricktown Center strip mall look like it was set really far back from Naragansett. I didn’t even venture in. Incidentally, no one mentioned this, but I believe that Kmart used to be originally housed in the north end of The Bricktown Center. 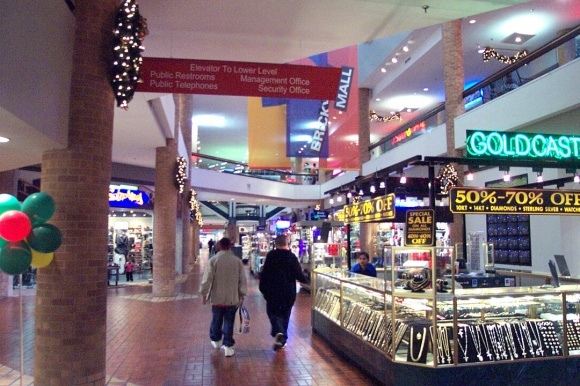 Bricktown Center also housed an Old Country Buffet, a Petland, a hip hop record place, and the “big anchor” for the strip center was Frank’s Nursery on the north end of the center. Just south of Frank’s Nursery, from what recall, was a weird drive up ramp that lead up to JC Penney’s. I don’t know why, but I always pictured it as a Sears location. do you remember anything about a piece of highway overpass that was sitting on the grass at the sw corner of the mall, by Grand avenue? It really looked liked someone just picked up a piece of highway and dropped it there….. I was trying to explain this to a friend and I am pretty sure he thinks I’ve lost my mind! 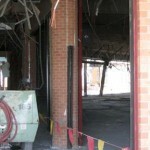 It’s gone now and they’re seems to be way too much concrete there smashed up…..
Anyways, thanks for the memories…. and to the author of this piece, thanks so much for the pictures. @Jeanny, That structure was from a radar manufacturer from WWII. They would test the radar units up on that structure. It had a track that they could roll the radar dish on to point it in different directions. 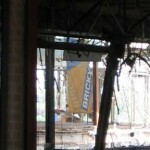 I also remember that area when the Carey Brick Co was still in business. We used to ride our bikes over to Thunder Mountain and explore the old clay pit. 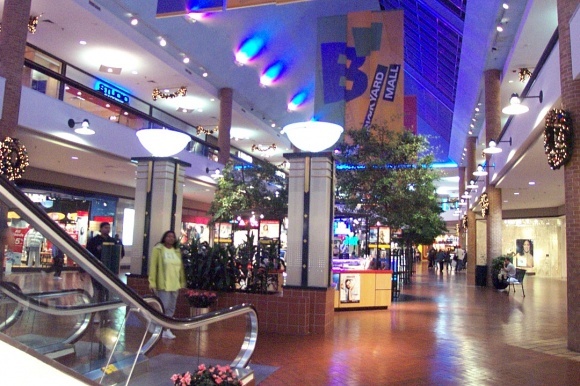 I only went to this mall once back around January of 02…I called everywhere in the city looking for a copy of GTA 3 and the only place that had it was in the Brickyard Mall. It was a weekday night but I had the mall all to myself. Such a ghost town I’m not surprised it’s gone. Thanks for the great pictures and commentary!!! 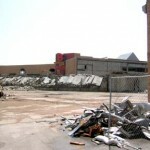 These are the only pictures I have ever seen on the internet of the “old” Brickyard Mall. I used to love this place, it was beautiful when it was built. In the later years, there WAS a lot of crime, not just rumors. Purse snatchings and muggings in the parking lot. 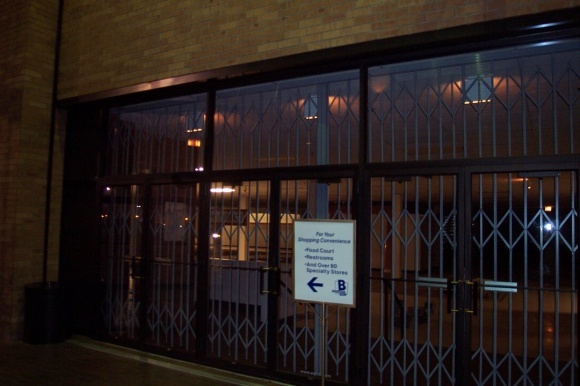 Went to the Bricktown theater once – a bunch of gangbangers started running around and yelling and acting crazy during the movie – little or no security. It was the first and LAST time we ever went there, even though we live just outside the city about 10 min. away. Used to take the Diversey bus from Harlem by myself, was in high school. That’s how safe it was in the early 80’s. 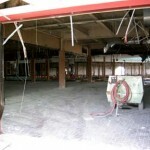 These pictures bring back a lot of memories, especially the LERNER store! Thanks for posting such a great story! Thanks for the the great post. 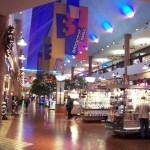 We went to this mall once in 1990, when I was a kid, just to check it out. What I remember most about it is its christmas radio jingle: “Come to the brickyard, the brickyard, your holiday center the brickyard”. Then in 2009 I went there to check out that (overrated and overpriced) Guatemalan chicken place and checked out a few stores in the strip mall. Depressing is the only way to describe it. There’s few things more depressive than a strip mall Foot Locker. 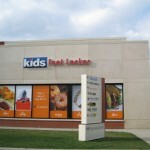 With a mall Foot Locker, you’ve at least got kids running in and out, spilling stuff on the carpet, knocking stuff off shelves… That’s what a Foot Locker should feel like. A strip mall Foot Locker, on the other hand, is sterile, always empty (I’ve also been to the Winston Plaza Foot Locker in Melrose Park and in both cases I was the only person in the store), and filled exclusively with third tier merchandise. Now that I think about it, a wholly depressing day. 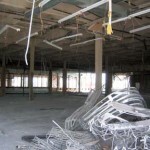 I would gladly start a Facebook cause for tearing down lifestyle centers if I didn’t feel that tearing down a perfectly good building is just plain stupid. I remember the yard as we called it. I use to go to Stienmetz a couple blocks away. The yarbd was our get away. I never really remember buying anything from there but it was a place to chill and get a slice of pizza. Good memories at the Yard. @Charlie, When I went to Steinmetz in the early 60s the Brickyard was a brickyard. Thanks so much for this page, awesome pictures and great memories! I have fond memories at this mall too. I still have old pictures with my brother and I sitting on Santa’s lap. The pictures back then were lamenated it has the Brickyard logo on the back of it! I also have one with Spiderman. 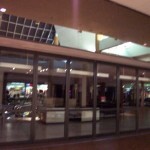 Unfortunately, this mall closed because there was such a high crime rate at that mall. My parents knew a Chicago police officer who said, alot of the crime went unreported in the news(paper) because they knew it would scare people away. Alot of cars being stolen and muggings in the parking lot. I work for JCPenney and I know that store was robbed once by armed robbers. They hid in the store after it closed. they forced everyone still in the store (employees) in the cashroom. 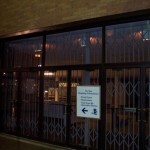 That JCPenney also had to employee security guards who were posted at the entrances. The theft and shrinkage was unbelievable. 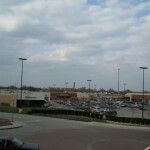 They did turn it into an outlet center for a short time after closing the store. I believe it was just to ride out the remainder of their lease. I’m willing to bet all the store in that mall were experiencing very similar circumstances. 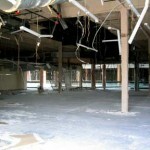 It’s too bad in it’s heyday it was a nice mall. Nice picture. I didn’t think I’d ever see the inside again! 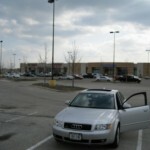 If I owned an automobile, or lived in another area closer to other shopping, I would never set foot in this mall again. I only shop here out of absolute necessity; I am older, and it would often be a hardship for me to travel farther for prescriptions, etc., especially in the winter. I am always upset by the repeated anti-white racial remarks I get from other customers, for no reason. I do not bother anyone — I just want to do my shopping and go home. Store personnel of the same race always side with the harassers. The last racial incident? It took place the last time I went there, two or three days ago. This place has problems, and I am tired of them. 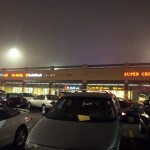 If I ever find a way out of this neighborhood, these miserable people can have the stores all to themselves. What’s the big deal? They’re no different than any other huge stores, in that they do not much care about customers — of any race. 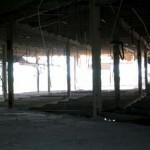 Great article and photos on the ol’ Brickyard Mall! Thank you for commemorating this place which was special to us for so many years. My brother found your site while trying to remember the name of the ice cream place we used to go there (We both think it was called “Winstons”). I spent lots of Saturday mornings there in the mid- 1980s, mainly during grade school years. My family lived further east, in the Kelvyn Park area, but I attended Luther Burbank School just south of the Brickyard. Chicago Public Schools had their regional “Hobby Shows” at the Brickyard each spring, as well as Art Shows, and I remember participating in a few. In 1981 I won an art award for an RTA (remember the RTA?) poster design and accepted my award at the Brickyard–I was so excited to get a $15 mall gift certificate –may has well have been $1000 to me the way I reacted. Funny mention of the weird floor plan connecting to the added on portion near K-Mart! That did always strike me as odd, too! Such weird angles to that place. Friends and I would hang out there and wander around with only a few dollars allowance. We were just kids! All we could afford was maybe 1 slice of pizza, and some trinkets from Claire’s Boutique or Spencers. I remember there used to be a t-shirt shop on the upper level where you could pick out a decal or decals and have them ironed onto a shirt, custom style. This was during the late ’70s-early ’80s iron-on t-shirt craze! 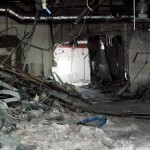 (By the mid 80s I think it was gone.) You could get all kinds of tawdry sparkly silly iron ons, with wacky quotes, pop culture characters, just about anything. 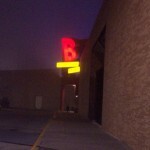 A favorite store was the bookstore– was it a Waldenbooks? Or Kroch’s & Brentano’s? Loved getting Beverly Cleary books in paperback. Also, what was the name of the 1st floor toy store? We spent lots of time there. I think there was a KB Toys upstairs, but the one we always went to was on the first floor, and I sure cannot remember the name! 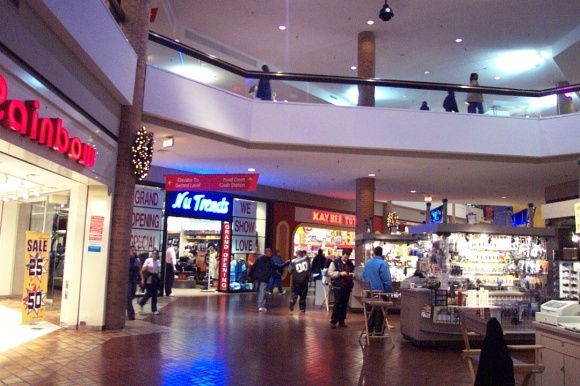 We went to the Brickard for back-to-school clothes, but also did much of our shopping in the “6 Corners” area- Irving,Cicero and Milwaukee–because there was a large Sears there as well as a big Gap store. As I got older I shopped at the Brickyard’s Wild Pair. What a great weird shoe store! Wasn’t there also a Limited and a Merry Go Round? My brother and I saved up on lay-a-way to surprise my Mom with a leather jacket from Wilson’s one Christmas. The Brickyard wasn’t that old– seems a shame they leveled it. I hadn’t been there since 1991 or so. Moved to Arizona in ’95. Even so, reading about the Brickyard’s rise and fall made me a bit melancholy. Thanks for the memories. The name of the t-shirt place was The Boston Shirt Yard. My friends and I were in 7th grade when the mall opened. We lived over by Diversey and Long and I remember walking over the first day it opened. It was amazing! I worked at the Penney’s a few years later and it was a great store at the time. 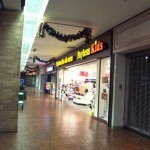 I remember there being a pizza place call Mazzone’s on the first floor at the mall entrance by Penney’s. I wish I could taste that pizza once again! There was also a fantastic hole-in-the-wall pizza place on the first floor by Wards that had terrific pizza! It’s a shame that a few idiot gang-bangers can bring their ignorant thug mentality with them wherever they go and ruin everything in their wake. They’re right – neighborhoods are so much better with gang tags, closed stores all over the place and people fearing for their safety! Way to go gangstas! 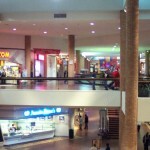 Great writeup on the mall, I was always hoping this site would eventually cover Brickyard Mall. (and props, you even used my quote!) I remember this mall well, and went here occasionally when I was young. My last time here was probably in 2001, as it was sometime after Wards and Kmart had closed, but just before Jewel and JCPenney pulled out. 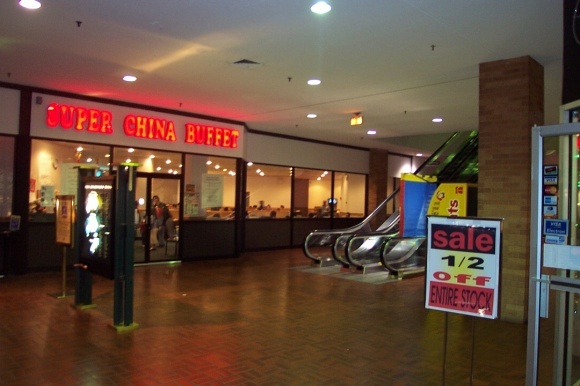 There weren’t many stores left in the mall then, save for limited exceptions like a Chinese buffet place and a few places in the food court. Looking back, it isn’t surprising to me they chose to demolish it and redevelop it into a lifestyle center, since Harlem-Irving Plaza always was a bigger mall, and since I knew it had developed a reputation problem in its final years of operation(but of course a not deserved one, I’ve gone to malls in predominately black neighborhoods before without any problem). 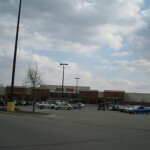 @Allan, I should note the convenience level obviously was little more than just an indoor connection between the Kmart and Jewel, and it reminds me much of Golf Mill’s very northern wing of the mall inbetween Sears and both Target and Kohl’s. Just basically an indoor connection between the anchors that never has has had many stores. 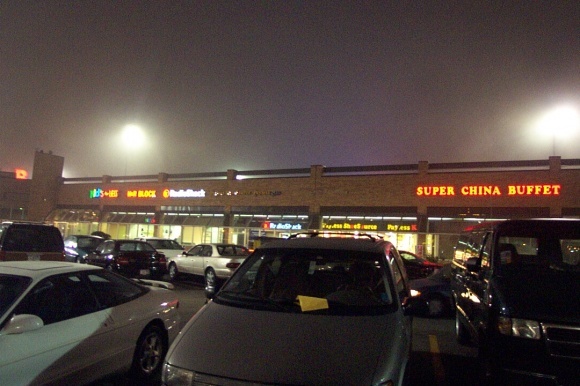 My recollection of Brickyard’s ‘convenience level’ is that it NEVER had many shops in it at all, save for a Chinese buffet that opened there in the late 90s/early 2000s right when the Chinese buffet craze was very new, and hitting strong throughout the Chicago area. Sorry for my absence from this site for much of 2010(plus also my own flickr page), I’ve been really busy with my life. Am planning to do more updates on it eventually, and haven’t forgotten about it. Enjoying catching up on all the updates since my last visit…..
@Allan, I wanna also say that there was a Burger King inside this ‘convenience level’ at one point. I’m not sure, but maybe someone else who remembers Brickyard better than me can confirm this? Yes, there was a Burger King in there. Note: There was definitely a Burger King in the lower “convenience level”. I used to go there once a week in 1984, en route from my grade school to the Diversey bus to take an art class downtown. 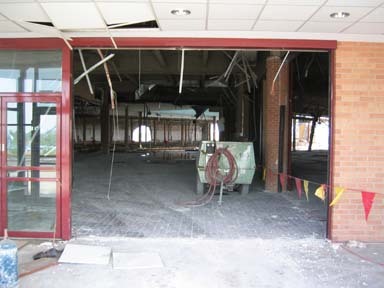 It was always a treat to get a cheeseburger at the Brickyard Burger King. 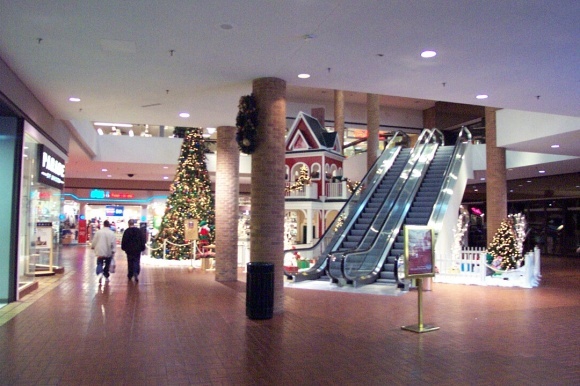 I remember it being kinda big and shadowy and tucked into a corner below the escalator. Yes there was a burger King there. It was behind the escalators. I worked there around 1980. Was still in HS. Next to burger king was an ice cream shop and on the other side was a jeweler. I don’t remember the name of the Jeweler. 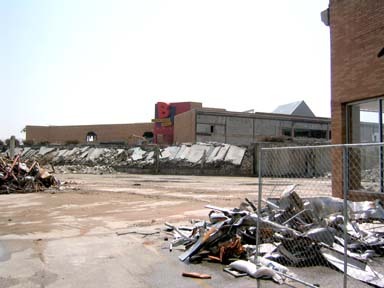 If anyone remembers the Petland in the Bricktown Center next to the now-demolished mall, give a shout. I worked there for a short while. 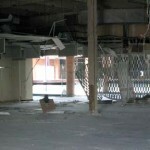 Just wondered what caused the demise of that store. It was hopping when I left in 93. @CoryTJ, Did you work at grand aquarium too. 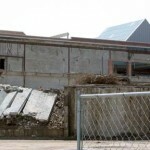 Used to live at Mobile & Wellington and knew the Brickyard when it was a hole in the ground. 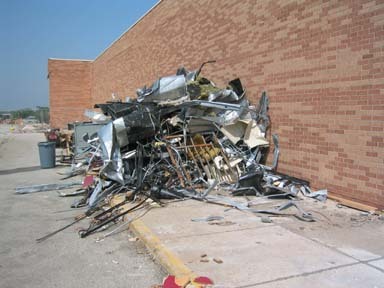 When we were freshman at Steinmetz I remember a friend and I would go to the bottom of the pit and take apart the junk cars just because. (Goofy kids!) My father in law owned the Go-Tane Gas Station on the corner of Narragansett & Diversey-I worked there for a while and remember the ill fated “Thunder Mountain” ski hill. My wife worked at the Jewel when if first opened and twenty years after-she has some stories about some of the creatures that inhabited the delivery dock (it was completely covered like a huge garage). I also remember Mr. Edwards Restaurant-they had a blond waitress that knew everyone and seemed to always be there, day and night. Oh well. I use to go every Sunday with the family and have a slice of pizza. I remember they use to have to 2 pizza places right next to each other. Does anyone remember the name of the pizza places?? @RT5, One of the pizza places was HOT PRETZEL. This was on the first floor next to the food court. Great nachos! Re: Grand Ave “what is that thing” highway ramp. This is from a wonderful blog on the Trib’s Chicago Now site. Go to the picture gallery and click through it a few, and all will be explained. 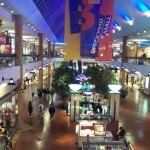 Grew up 3 blocks away and practically grew up at this mall. We went there as kids for our shopping, hair cuts and just plain hanging out. My family and neighbors all shopped there back then but things started to change when they made that arcade next to Kmart. 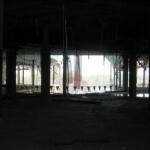 The arcade would be open till 11 on weekends and it would attract alot of street kids or gangbangers. 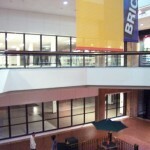 Then the theater was made when the bricktown was added to the mall. So now the mall was a hang out on the weekend for all of the thugs. 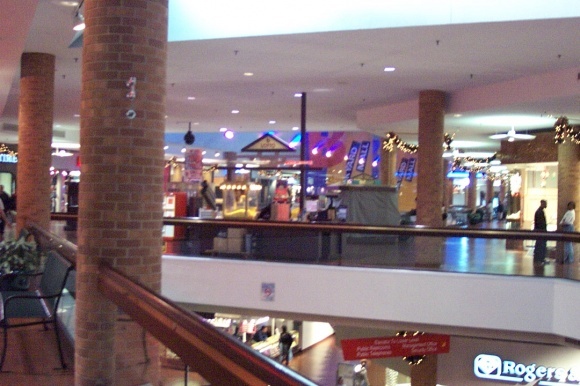 They would walk around the mall, then go see a movie and then go to the arcade. So on weekends it was best to be done with your shopping by 6:30 or so. The last time I went to the movies there I saw higher learning which was a racial movie and I was with my girlfriend who is now my wife and you can smell the weed in the air and the racial slurrs being yelled. White people were walking out of the theater in fear that something would happen. Police were at the theater every weekend to control the teens and I dont mean that they were called I mean they literally had to be there from the hours of like 8 til close every weekend. 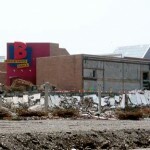 It all went downhill from there and we lost our mall. 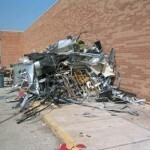 I blame the teens from the Austin area – they pretty ruined the area just liked they ruined my high school – Steinmetz. My mom still lives in the area and the neighborhoods are ok but still have to be cautious at night cause you never know. 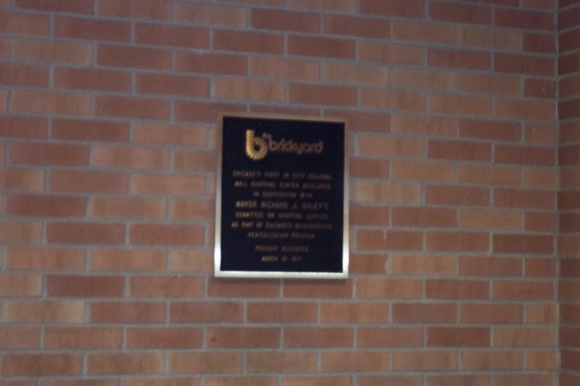 The first paragraph of your essay states that the Brickyard opened in March, 1977, but that is incorrect. 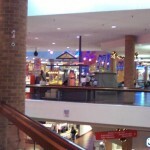 I was one of the first employees opening that mall at a store called Merry-Go-Round. 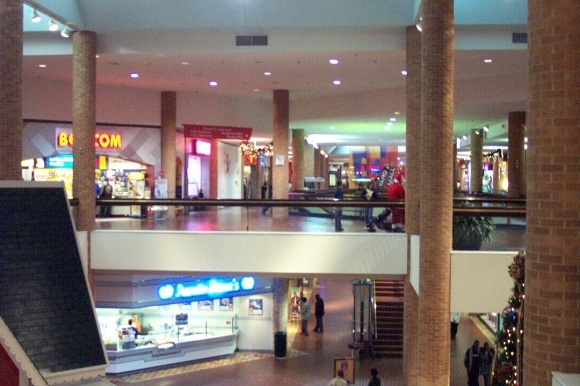 That multi-stored section of the mall opened in late February, 1978! I financed my college career by working at Merry-Go-Round, Susie’s Casuals and Ole/Uno Jewelry. I was filmed in a commercial for the grand opening of that mall. I remember it like it happened yesterday. Hi does anyone know if The Cookie Factory from Brickyard in the 80’s is the same one that opened in Lincolnwood Town Center in the 90’s? I have been looking for their decorated sugar cookies that wasn’t soft, it was hard ti bite down on but so yummy. I used to always go to that record store outside the mall, but i can’t remember the name of it..they always had the best vinyl. @J, I believe it was called Hip House. I used to get my Bad Boy Bill Hot Mix tapes from there. 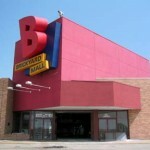 I worked at 3 stores in the Brickyard, Montgomery Ward, Orange Bowl and the photo shop. 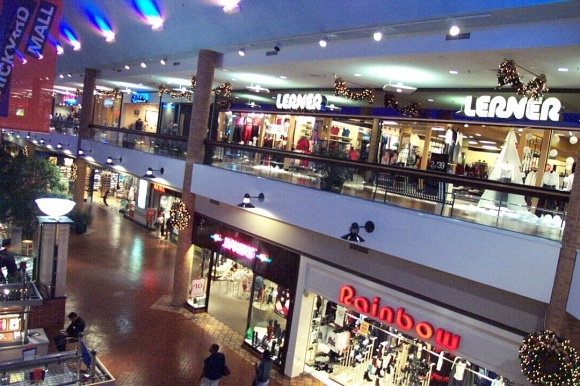 It was a great place back in the 80’s for kids to hang out and shop. It kept me off the streets! I enjoyed looking at these pictures. 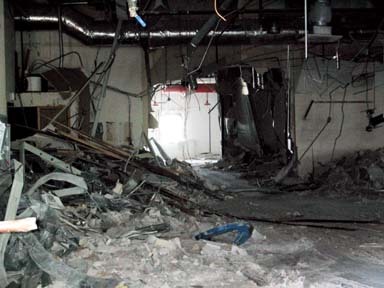 These were taken after a remodeling. sometime in the late nineties. I remember going to the Brickyard in the eighties. I remember waling in their one time in the early nineties and didn’t feel safe. It was more urban. Anyways, the developers felt that if it was converted into an outdoor plaza that the gangbangers would not have have a place to hang out thus attracting more people that are actually there to spend money. God Bless you for taking these pictures! Coming across this site was more than I could hope for. I grew up in Chicago, and the Brickyard was a place that I spent a great deal of time in the 1980’s as a teenage girl. I moved away many years ago, and only recently came back for a lengthy visit. So many things have changed, and so many of my favorite places are now gone. It is difficult for me, because i had no idea, and so never came back, or got to go anywhere just one more time. These photos let me do that, they let me say goodbye. They also bring back many fond memories of my old friends, and the good old days 🙂 Thank you so much for having the foresight to take these wonderful pictures. And at Christmastime too! Ahhh….such wonderful memories! P.S. I drove through the “new” Brickyard and absolutely hate it. 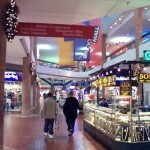 There are many places just like it all over the place, so why shop there? The traffic also makes it inconvenient. They should have kept the mall part. They could of definitely made better use of that space. I won’t be shopping there. HUGE disappointment. Thanks so much for all the great photos! I hung out there and worked there as a teenager in the 80’s. My first job was at Bresslers Ice Cream (between K-Mart and Jewel, near Burger King). I also worked at Whistle Stop and then Rose Records when it opened INSIDE Wards in 1990 approximately. My mom often took me to Hot Pretzel for pizza – such great memories. That place was a huge part of my childhood. The pics are fantastic. Thank you so much! I grew up in Logan Square and I used to take the Diversey bus to the Brickyard all the time. I used to cut school to hang out there with my friends. I have so many memories. 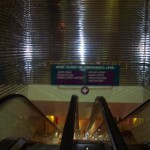 I remember the Burger King right under the escalator before Montgomery Ward’s. 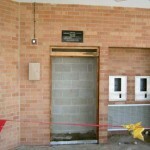 I also remember taking the elevator to the basement to use the restroom. 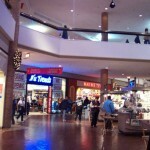 There was a Bell Phone Center Store and a really cool clock store just outside either Penney’s or Ward’s. Thanks for posting. In the 80’s I worked in the mall at Park lane hosiery and remember many of the elderly folks who’d get here quite early for their morning walks. My sister and I reminisce about the good old days as kids coming to this mall with our parents durning the holidays and it would absolutely be crowded. Shopping here was a weekly thing for us and as we spent many Saturday’s there with my parents we also made it a tradition to eat at York steak house which was located on the 1st floor inside the mall. 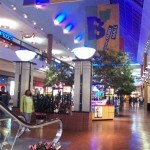 But as time went on this mall just went down hill and became known as the ghetto mall. 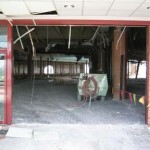 Does anyone remember YORK STEAK HOUSE??? in 1997 my mother was robbed at gunpoint in the parking lot in front of sportmart. other than that, i loved the place. my era was 1992-2001. 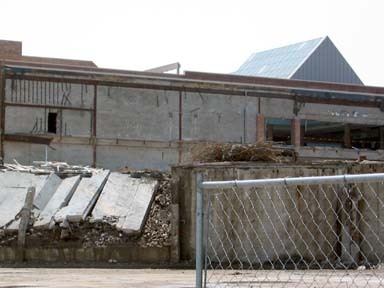 I have many fond memories of the going to the Brickyard Mall(early 1980s-1990s),especially of Montgomery Wards,JC Penney and eating at the York Steakhouse. Thank you for the pictures. i worked at the Montgomery Wards from *81-82″ Christmas season in fine jewelry. They hired me back for 82 season and ended up keeping me I work there til 85. 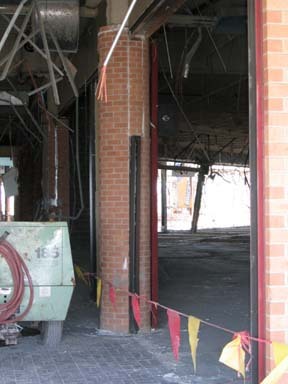 Many great times at Wards. All the employees had a blast working there. We were young and in college. Had great parties. 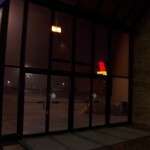 I also remember York Steak house at the Brickyard they had the best honey glazed chicken! A great pizza place too! I LOVED the Brickyard and loved YORK Steakhouse!!!!!! i had kids, and that is where i took my kids to get out of the house… it had everything… only one prob. 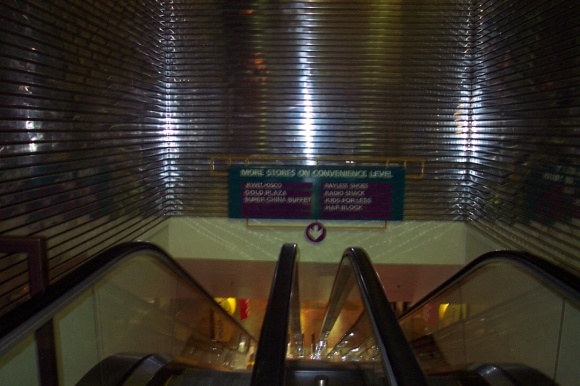 that i remember… if you were downstairs by kmart and wanted to go upstairs to wards, there was only an escalator to take you up there… if you had a stroller, you had to go to your car and drive up there… I quickly learned how to maneuver the stroller up the escalator there.LOVED THAT MALL IN THE DAY. I don’t remember driving to Brickyard but some fashions shows were there from what I was told. Thanks for the wonderful pictures. I worked there during high school in the 80’s and like a typical mall rat, can name and place most of the stores there back then. Many cool events took place there too. When The HIP started staying open until 9pm on Saturday, and catering to the brickyards clientele, it was a huge turning point for the brickyard. It was only open until 6 or 7 on Saturday. What great pictures. Thanks again!